I promised you a look at the changes to the Tour de France points competition. As promises go, it’s perhaps one you wouldn’t mind seeing broken. It’s maybe not in ‘I promise to break your kneecaps’ territory, but it would surely run ‘I promise to make something healthy for tea – maybe I’ll use up that Quorn’ pretty close. But while this topic perhaps isn’t the most exciting to ponder at the start of January, it is relevant. While it takes a long time for the Grand Tour general classification contenders to get going, the sprinters are pretty much always on, so the early races in the season offer a good idea what we might expect in July. The first 15 riders across the line get points on every stage, unless it’s a time trial. Previously, the points available were 45 for first place, 35 for second place, 30 for third and then declining numbers from then on. It didn’t matter whether it was a flat stage, a mountain stage or a hilly stage – it was all the same. Under the new rules, points will be distributed differently on flat stages only – 50 for the win, 30 for second, 20 for third. At first, you think an extra five points for the win is neither here nor there – and that’s probably true. Of more relevance is the drop in points for placing well. In short, there’s less to be gained in a bunch sprint unless you actually win. What does this mean for the green jersey competition? Well, in theory, it rewards the best sprinters and punishes the all-rounders. And let’s not beat about the bush here, by ‘all-rounders’ I mean Peter Sagan. In 2014, Sagan all but secured the points competition in the first week with seven top-five finishes in the first seven stages. He was way ahead of Marcel Kittel even though the German had won three stages. The idea with the new system is that this wouldn’t happen. However, while the best sprinter should end up with more points, that only really works if he’s dominant. If several top sprinters share the wins between them, there are actually 10 fewer top-three points to go around. There’s also the fact that tweaking the points competition doesn’t alter the fundamental truth that Sagan is pretty much the only top sprinter who can all but double the points available to him by also competing on hillier stages. I can’t find it now, but someone somewhere completed the mind-numbingly tedious task of applying the new points system to last year’s race and lo, Peter Sagan would still have secured the green jersey. So that’s it then – it’s a pointless change? No – a change to pointlessness really would have an impact on the points competition. But actually even this minor change may see things pan out differently for the simple reason that it will affect the way people race. 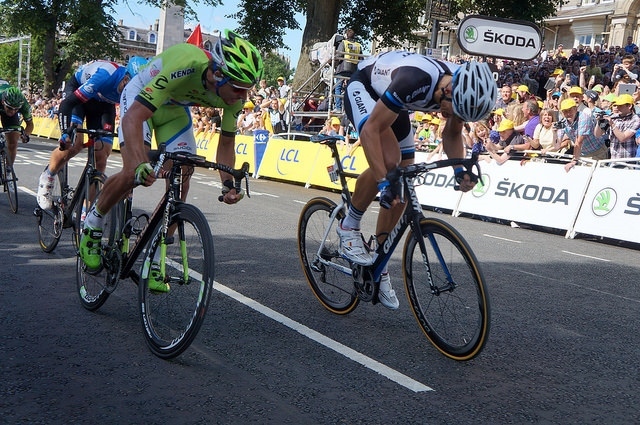 For example, Marcel Kittel rarely bothered going for intermediate sprints in the 2014 Tour because he knew he had no chance of dragging the green jersey of Sagan’s meaty shoulders. Now the balance has shifted and he has already said that the points competition is a goal. Ironically, for his part, Sagan says the points competition is no longer something he’ll go for. What he wants is stage wins. He’s sick of finishing second in green – so much so that he’s even moved to a non-green-clad team in the form of Tinkoff-Saxo. It’s just talk though. Sagan’ll be going for the points competition, same as always. It’s hard to avoid anyway as it’s basically a byproduct of going for wins. That’s pretty much the whole point of it, if you’ll excuse the pun. Another rule change sees the introduction of time bonuses – or ‘bonifications’ if you like – for the first nine stages. I’ll take a look at this later in the week as it will contribute to the narrative of this site over the 2015 season.